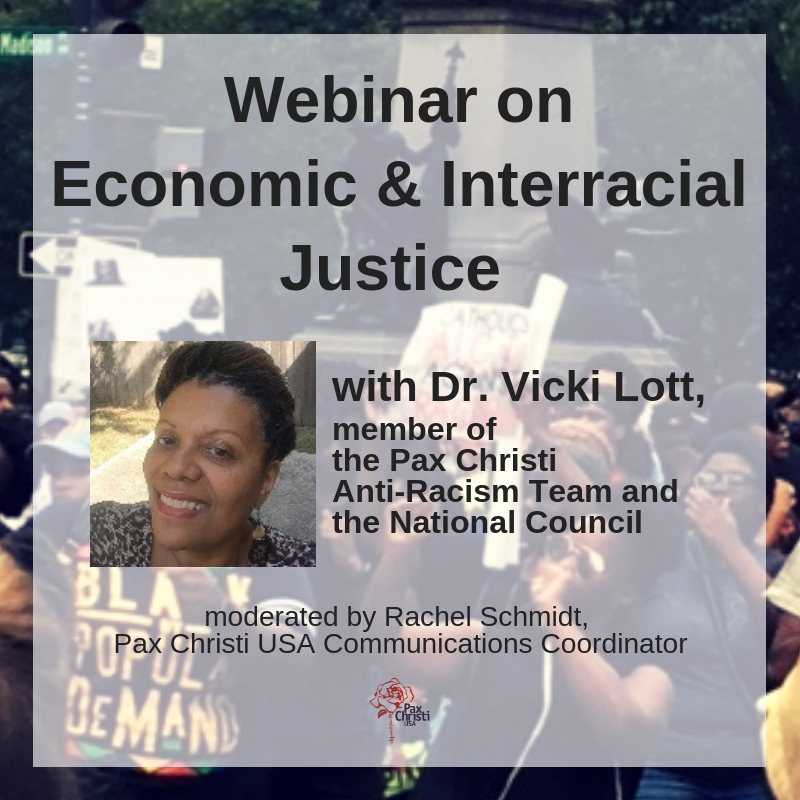 PAX CHRISTI LOCAL AND REGIONAL GROUPS INSTRUMENTAL IN SUPPORT FOR IRAN DEAL: (from Tom Webb, PC-Northern California) Pax Christi Northern California has selected Lorrain Taylor founder of “1000 Mothers Against Violence” to receive their Peacemaker Award. Taylor will be given the award at Pax Christi Northern California’s regional assembly on Saturday, October 17th at St. Elizabeth’s High School in Oakland’s Fruitvale District. Besides presenting Taylor with the Peacemaker Award, assembly events will include an opening keynote panel featuring Sr. Megan Rice, Rivera Sun and Elizabeth Murray. Sr. Megan was recently released from prison after serving a 2 ½ year sentence for illegally entering the Y-12 nuclear weapons plant in Oak Ridge, Tennessee. Sun is an author and a nonviolence trainer for Pace Bene. Murray served as Deputy National Intelligence Office for the Near East on the National Intelligence Council before retiring after a 27-year career with the CIA. She is a member of Veteran Intelligence Professionals for Sanity (VIPS) and the Ground Zero Center for Nonviolent Action in Poulsbo, WA. Speakers will address topics including the Bay Area housing crisis, human trafficking, accompanying immigrants, Pope Francis’ recent ecological encyclical “Laudato Si”, nuclear abolition, restorative justice, Ceasefire Oakland, root causes of Central American immigration, conscience and national service and the nonviolence movement. The Bishop Sullivan Pax Christi in Norfolk presented Prof. Robert Watson (right) of Hampton University speaking on the history of slavery at Virginia Wesleyan Univ. 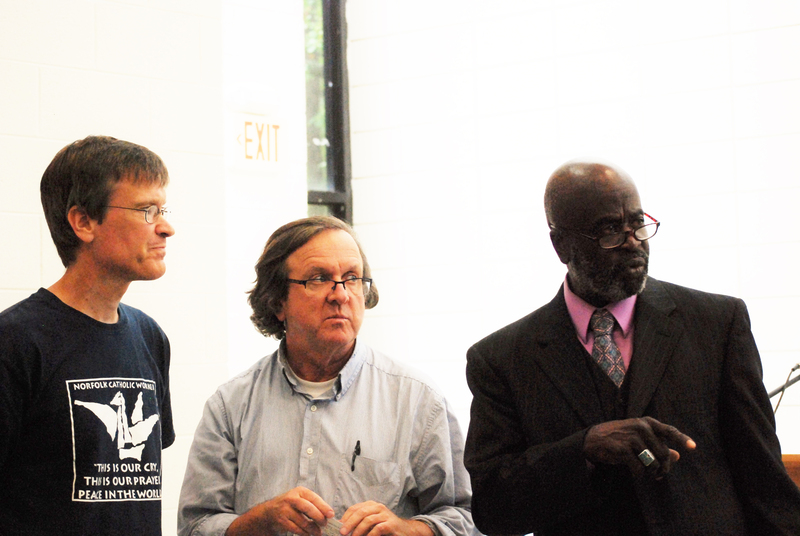 PAX CHRISTI MEMPHIS PRESENT BISHOP WITH STATEMENT ON IRAN DEAL, NUCLEAR THREAT: (from Paul Crum, PC-Memphis) On Sept. 28 Fr. Al Kirk and Jerry Bettice met with Bishop Terry Steib to discuss PC-Memphis’s concern about the Iran deal and Catholic teaching on the possession of nuclear weapons and the threat they pose to our world. This meeting was a follow-up to the letter sent to the bishop after the August meeting in which we featured the 70th anniversary of the atomic bomb attacks on Japan. The bishop asked for a written statement that expresses the concerns and possibilities put forth in the meeting. At the Oct. 13th meeting of PC Memphis, Bettice will present a draft of the document for feedback with a view of presenting a more complete view of what we hope he can do in conveying Catholic teaching to the local church of the diocese of Memphis. 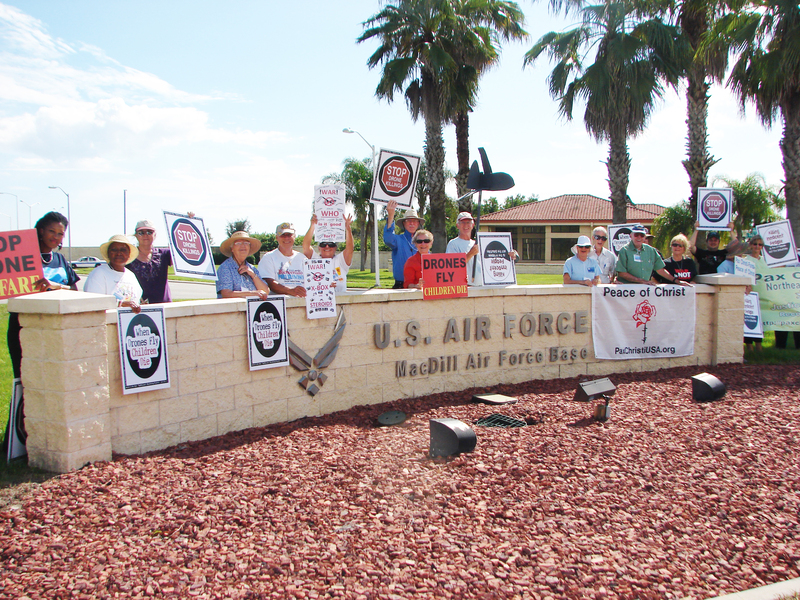 PC Florida held their state assembly in Tampa & protested drone warfare outside MacDill Air Force Base during the Campaign Nonviolence Week of Actions. 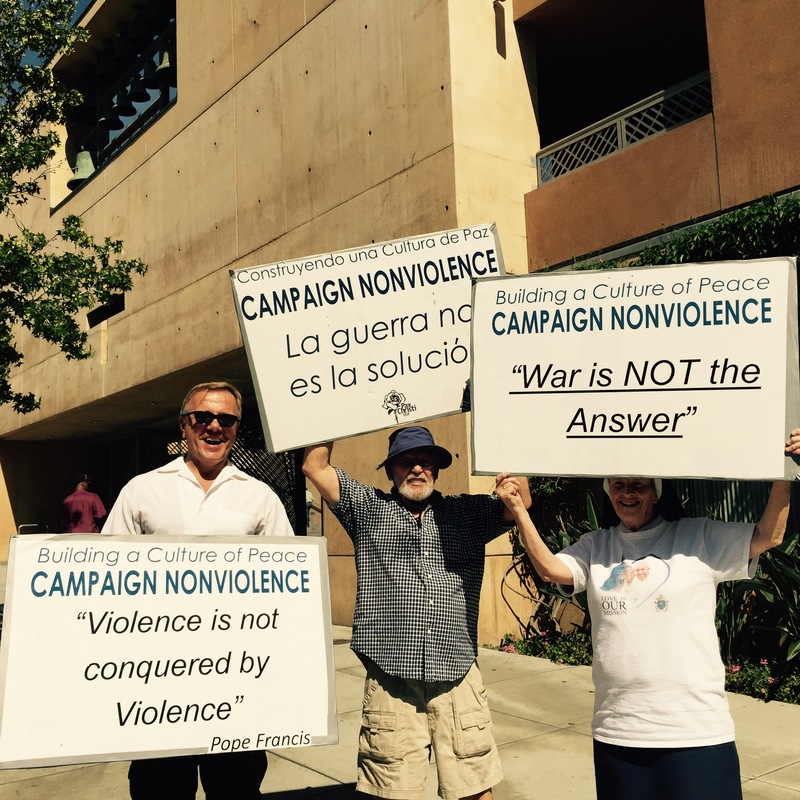 Prayer vigil at the Cathedral in Los Angeles as the closing event of Campaign for Nonviolence and Pax Christi Los Angeles and Pax Christi Southern California’s support of Pope Francis’s call for end to nuclear weapons. Oct. 16-20: Peace Alliance conference in Washington, D.C.
Nov. 20: Pax Christi USA gathering at the SOA in Columbus, GA. Stay tuned for more info. We have a room reserved for 6pm, Friday eve at the Columbus Convention Center.